MRZ Reader is a smart combination of an optical reader with a contactless reader. It is optimal solution not just for document reading and checking, but also for document issuing as well (quality check, RFID inlay writing and reading). MRZ Reader captures images in visible and IR illumination, reads the MRZ lines, reads RFID tag printed inside the passport, and transfers the data to the processing information system. 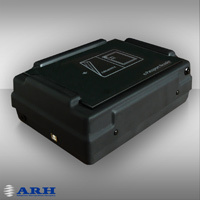 It is available as OEM optical unit for RFID reader manufacturers to integrate it with their own RFID reader.